Geographic mobility is thought to be important both for economic mobility and for the efficiency of a labor market in allocating the right people to the right jobs. Accordingly, the willingness of the U.S. workforce to move is a factor behind the greater dynamism of the U.S. labor market compared to Europe. While Europeans tend to be more reluctant to move to distant places within their respective countries, the idea of moving across state borders for a job has been woven into the fabric of the American Dream. However, the image of the United States as a mobile nation has changed substantially over recent decades. This post investigates the role that demographic shifts—in particular, the nation’s aging population—have played in the recent decline in interstate migration. 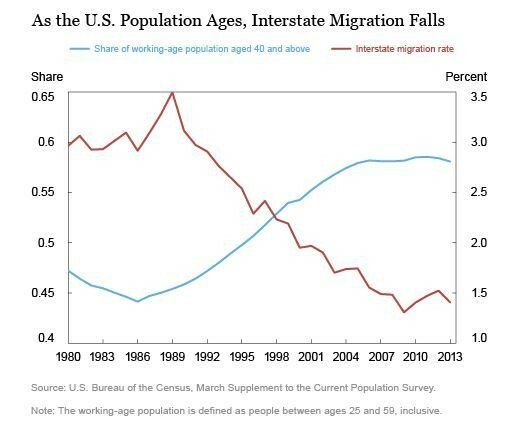 About 3 percent of the working-age population—defined as people from ages 25 to 59—moved to a different state in a given year during the 1980s, as shown in the chart below (see the red line). Starting in the 1990s, this rate declined steadily, falling below 1.5 percent by 2010. While part of the decline can be attributed to the Great Recession, the bulk of this phenomenon took place over the course of several decades and is unlikely to be related to the business cycle. According to data from the 1998-2013 March Supplements to the Current Population Survey (March CPS), slightly more than half of interstate migrants said they moved for employment-related reasons—a category that includes moves undertaken for new jobs, job transfers, and easier commutes (see table below). Roughly a quarter of interstate migrants cited family-related reasons, while the remaining quarter noted other motivations such as health, better housing, climate, and, in recent years, foreclosures. Given the role of mobility both for individual labor market outcomes and for the overall efficiency of the aggregate labor market, the long-run decline in migration rates could indicate a decline in overall labor market dynamism. Many policymakers have worried that lower mobility is associated with a more rigid economy where workers cannot move to locations with good jobs. Lower mobility might cause the labor market to be slow in adjusting to shocks, making downturns longer and recoveries slower. To understand the consequences of declining migration, one needs to first determine whether the decline stems from the inability of workers to move (for example, owing to rising moving costs) or if it is an efficient response of the labor market to a changing environment. This post investigates the role of demographic shifts in this decline, in particular population aging. The fraction of middle-aged people (ages 40 to 59) in the working-age population has increased from around 45 percent to nearly 60 percent over the past three decades (see the blue line in the chart above). Previous research has established that mobility rates fall precipitously between ages 25 and 40, and then stabilize in older ages. Coupled with this pattern, the shift toward an older population may explain why overall migration rates have fallen. 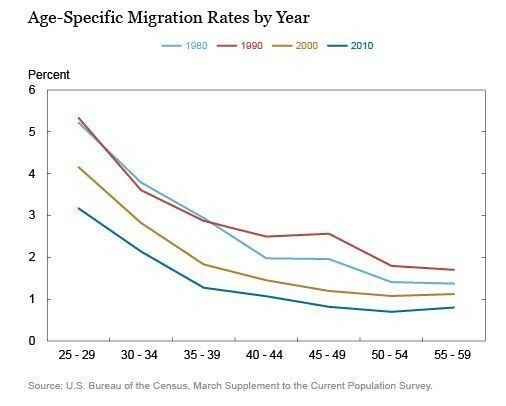 In order to quantify this direct effect, we calculate counterfactual migration rates for each year after 1980 by fixing the age-specific migration rates to 1980 levels and taking the weighted average of these fixed migration rates using the actual age composition of the population. In this measure, represented by the red line in the chart below, changes in the migration rate are entirely the result of shifts in the age composition. Consistent with the observations above, population aging does indeed push down the migration rate, but it can explain less than 20 percent of the decline we have observed. 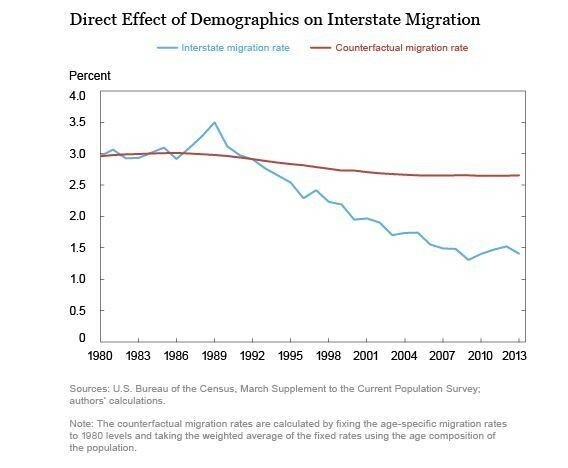 A natural consequence of this observation is that most of the decline in interstate migration actually reflects a decline common to all ages. And in fact, as shown in a 2013 Federal Reserve Board working paper , the migration rates of all age groups have fallen (see chart below). What caused young and middle-aged people to move less over time? While there are different hypotheses, a recent New York Fed staff report finds that the decrease in mobility is owing to an indirect effect of population aging. In essence, firms might respond to changing demographics by changing how and where they recruit workers. They can do a local search or engage in a geographically broader search, which could be nationwide. Middle-aged people are less likely to look for jobs in distant labor markets, possibly because they face higher moving costs because they have families or existing local networks. Thus, a firm engaging in a nationwide search is more likely to attract younger applicants, while a firm engaging in a local search is more likely to face an older pool of applicants. According to this theory, an increase in the share of middle-aged people in a market makes local recruiting more cost effective. As a result, firms tend to look more for local workers, increasing the prevalence of job postings targeted to local job applicants. An immediate effect is that younger workers in a labor market with an aging population have an easier time finding local jobs and thus do not have to move out of state to find a job. While this indirect channel is difficult to observe empirically owing to the lack of data on firms’ recruiting strategies, the theory has several implications that can be tested empirically. First, all else held constant, the migration rate of an individual should be lower in a labor market with an older population. Second, as a result of firm response to population aging, the share of hires from within a labor market (“local hires”) should be higher in a location with an older population. We test these two implications by exploiting cross-state variation in demographic shifts. While population aging is an aggregate phenomenon, its timing and extent differ quite widely across states. The age composition in a state likely depends on labor market conditions in that state. Therefore, one cannot directly relate migration rates to demographics, as these are jointly determined. To overcome this empirical challenge, we use lagged birthrates in a state to generate variation in the age composition that is not related to current labor market conditions. To test the first implication of the theory, we control for a range of individual characteristics such as age, education, marital status, and so on, and run a model of migration on the age composition of the state where the worker lives. The first column of the table below shows that an individual who lives in a location with a 10 percent higher share of middle-aged people is 31 percent less likely to move. Combining this estimated indirect effect with the direct effect of the rise in the share of middle-age people over the past three decades, we find that population aging can explain about 1.3 percentage points of the 1.5 percentage point decline in migration. To test the second implication, we follow a similar strategy and estimate the relationship between the share of middle-aged people in the state and the share of local hires. The second column of the table shows that the share of local hires increases with the share of middle-aged people. In particular, a 10 percent rise in the share of middle-aged people implies a 30 percent rise in the share of local hires. A natural consequence of the firm response is a shift toward local hiring in the aggregate. The chart below uses data from the Survey of Income and Program Participation (SIPP) and plots the fraction of distant hires—hires from outside the state—in a given year. Interestingly, consistent with the hypothesis, employers have become less likely to hire workers from a different labor market. In particular, the share of distant hires from unemployment has decreased roughly 2 percentage points. Quantitatively, our estimates imply that the direct and indirect effects of population aging can explain at least half of the decline in migration. Overall, data lend strong support to the indirect effect of population aging, which is a consequence of the employer response to changing demographics. In short, a young individual today is moving less than a young person did in the 1980s because of the higher presence of older workers. These findings suggest that the declining trend in interstate migration is a response of the labor market to an aging population and does not necessarily signal a decline in the market’s dynamism or efficiency. Disclaimer The views expressed in this post are those of the authors and do not necessarily reflect the position of the Federal Reserve Bank of New York or the Federal Reserve System. Any errors or omissions are the responsibility of the authors.